Federal legislation replacing the No Child Left Behind act was recently passed. The new ESSA (Every Student Succeeds Act) has some changes affecting teacher evaluation that we shouldn’t ignore. States now have the authority to decide about their evaluation systems. It is no longer federally required to use standardized test scores in the teacher evaluation process. Unfortunately, legislation was passed in Oregon (Senate Bill 290) that led to rule making that requires tying test scores to evaluations. 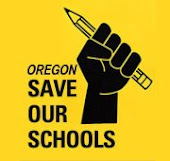 The Oregon Education Association (OEA) participated in the process from the beginning. It hasn’t turned out well and we need to admit it, and then do what we can to fix the situation. Most would agree that we were sold a bill of goods throughout the entire process of legislation and implementation of SB 290. Initially, teachers were led to believe that it would be a truly collaborative process and test scores weren’t even mentioned. Both teachers and administrators were to work on developing the evaluation system for both employee groups, but in most places teachers had very little input on the administrator evaluations. OEA tried to do damage control but didn’t prevail on many critical aspects. During a training on the new evaluation system, a teacher asked a question about how you would account for chronically absent students in the goal setting process. The Chalkboard Project representative told the teacher that chronic absenteeism is a result of the teacher failing to motivate the students. This answer was unfortunate and inaccurate; the state allows districts to collaboratively determine with their teams what attendance thresholds would be used. Equity issues were never resolved regarding educators that don’t teach in the tested grades and how the system would be made fair for those who have to administer the Smarter Balanced tests. This whole process has resulted in kids being tested to death not just on the high-stakes assessments, but assessments by every specialist that the student comes in contact with. Ideally, the next steps will be to eliminate the use of Student Growth Percentiles (SGPs), because this data exists nowhere except in the old NCLB waiver. Additional targets of elimination should be the Category 1 SLGG requirements and the use of summative evaluations that result in a number. The Governor’s office and the Chief Education Officer (CEdO) have been noticeably quiet and absent. Phone calls are not returned. We’re not quite sure what is going on in the chief education office. It’s hard to know what the Governor’s agenda is on any topic. It is election year. I spent $100 last week as a campaign contribution to go to a small mixer where I would have a chance to talk to Governor Brown. I told her the CEdO had not returned my phone calls and asked for her direct contact so I could discuss education related issues. I’m still waiting on the follow up from that contact. The system is not set up for meaningful and consistent educator input. SB 290 and the corresponding rules need to be amended as soon as possible. At a recent Title III Directors Meeting at the Oregon Department of Education, the new law was explained and then it was simply stated that we have state legislation and we would go on with business as usual. We have no data to show that the millions spent have had an effect.